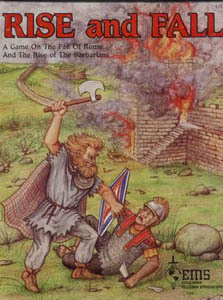 RISE and FALL is a game for one to six players. It portrays the last days of the Roman Empire when internal revolts weakened Rome from the inside and barbarian hordes invaded her border areas. Players control the Eastern or Western Roman Empire, the Persian Kingdom, or one of the numerous barbarian nations. When barbarians become strong enough, they form kingdoms, and kingdoms evolve into empires that have all the problems of Rome! Note that a player is never eliminated! If a player's country is conquered, he can return to the game as a new barbarian group, and seek revenge against the player who got him!! EMS published RISE and FALL in 1989. Karsten Engelmann is the designer. It is now out of print. Canadian Wargamers Journal (Vol. 4, Issue 3; Vol. 3, Issue 6; and Vol. 7, Issue 3) published several articles related to the game, including a Formation of Empire scenario, Punic War scenario, and rules clarifications, mechanics, strategy notes, and an example replay. Other articles have appeared Wargamer (Vol 2, No. 12: "Production Spiral"; Vol. 2, No. 16: Developer's comments and another article) and Fire & Movement (No. 65: review article). A freeware version of RISE and FALL was available from PC Wargames. Web Grognards has posted several articles. BoardgameGeek offers information. ConsimWorld offers some discussion about the game. As of 9/27/2017, we are in discussions with a game publisher to issue a second edition of Rise and Fall. Contact Kaarin Engelmann if you would be interested in a PBEM game of Rise and Fall. 72 "independent kingdom" and 36 "revolting infantry" counters. They are red on white.